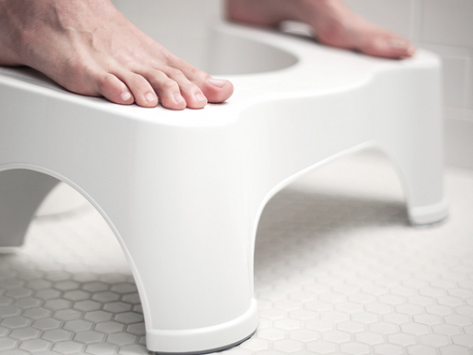 Elevates feet during elimination, promoting colon health. Dimensions: Ecco 7": 20" x 14" x 8"; Ecco 9": 20" x 14" x 10"
Bought as a joke, well received, even more well used! I bought this after a friend raved...and yeah, it is totally worth it. Buy one! At first it was really heard to use. You wouldn't think it was a big deal but the angle of your body really matters. It takes practice. In our high-tech world, it’s fascinating to discover a low-tech product that can provide relief from common health ailments. The Squatty Potty is just a stool—no buttons, screens, whistles, or bells—but it can lead to healthier bowel movements. 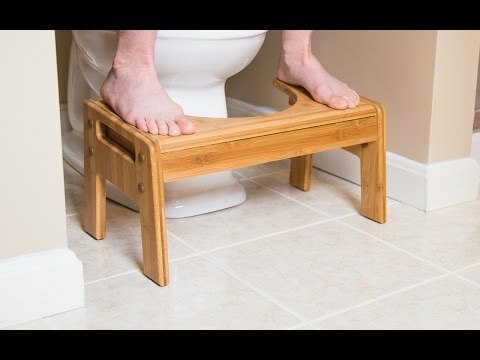 The premise is simple: The Squatty Potty helps you get into a squat position while you’re going to the bathroom, which is the ideal posture for emptying your bowels. Raising your knees in this way is healthier than sitting, experts say, since a squat position can straighten kinks restricting the colon. Bobby Edwards came up with the idea for the Squatty Potty to help his mother, Judy, who suffers from colon-related health problems. Judy was using bulky phone books, boxes and stools to adjust her bathroom posture before Bobby and his father, Bill, devised a more streamlined squatting platform. The benefits of using Squatty Potty include faster, cleaner, and easier bowel movements. Proper bathroom posture also can help prevent colon disease and alleviate ailments such as constipation, hemorrhoids, and pelvic floor issues. When it’s not in use, the Squatty Potty can be stored discretely at the base of the toilet. Are you ready to step up and try a new way to go?